Mahabharata has been traditionally described as the encyclopaedia of Indian life and has been treated as a perennial source of pragmatic and philosophical wisdom. Essentially it is the saga of a fratricidal war, but within this template it has grown from a text of 8,000 verses to an enormous volume of more than 1,00,000 verses, containing many stories and narratives which underline some or other aspect of the evolving wisdom. This text not only provides valuable historical and cultural information, but also deep reflections on the nature of dharma, public morality and ethics. It reflects deeply on the issues of war and peace, violence and non-violence, human relations and the related moral dilemmas faced by us in everyday life. The intent of the proposed course is to help the participants to appreciate the literary beauty and cultural significance of Mahabharata. 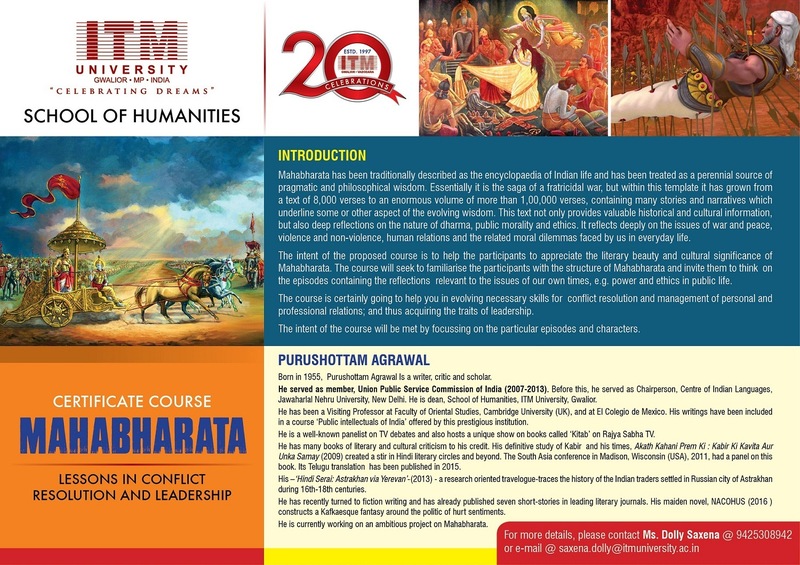 The course will seek to familiarise the participants with the structure of Mahabharata and invite them to think on the episodes containing the reflections relevant to the issues of our own times, e.g. power and ethics in public life. The course is certainly going to help you in evolving necessary skills for conflict resolution and management of personal and professional relations; and thus acquiring the traits of leadership. The intent of the course will be met by focussing on the particular episodes and characters. Born in 1955, Purushottam Agrawal Is a writer, critic and scholar. He served as member, Union Public Service Commission of India (2007-2013). Before this, he served as Chairperson, Centre of Indian Languages,Jawaharlal Nehru University, New Delhi. He is dean, School of Humanities, ITM University, Gwalior. He has been a Visiting Professor at Faculty of Oriental Studies, Cambridge University (UK), and at El Colegio de Mexico. His writings have been included in a course ‘Public intellectuals of India’ offered by this prestigious institution. He is a well-known panelist on TV debates and also hosts a unique show on books called ‘Kitab’ on Rajya Sabha TV. He has many books of literary and cultural criticism to his credit. His definitive study of Kabir and his times, Akath Kahani Prem Ki : Kabir Ki Kavita Aur Unka Samay (2009) created a stir in Hindi literary circles and beyond. The South Asia conference in Madison, Wisconsin (USA), 2011, had a panel on this book. Its Telugu translation has been published in 2015. His –‘Hindi Serai: Astrakhan via Yerevan’-(2013) – a research oriented travelogue-traces the history of the Indian traders settled in Russian city of Astrakhan during 16th-18th centuries. constructs a Kafkaesque fantasy around the politic of hurt sentiments. He is currently working on an ambitious project on Mahabharata.